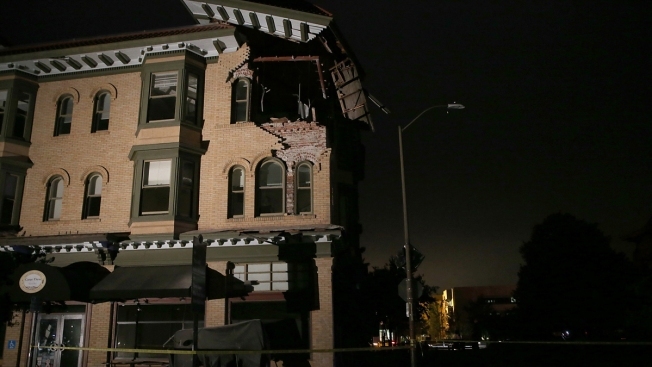 A building is seen destroyed following a reported 6.0 earthquake on August 24, 2014 in Napa, California. A 6.0 earthquake rocked the San Francisco Bay Area shortly after 3 am on Sunday morning. State and federal assistance now exceeds $2.4 million for residents of Napa and Solano counties who were affected by the 6.0-magnitude earthquake in August, according to the Governor's Office of Emergency Services. Victims of the Aug. 24 earthquake became eligible to apply for individual assistance on Oct. 27. Nearly 1,900 homeowners and renters have applied for assistance from the Federal Emergency Management Agency, according to the state Office of Emergency Services. The assistance includes grants for temporary housing, hone repairs, medical expenses not covered by insurance and other serious disaster-related needs. Low-interest disaster loans also are available from the U.S. Small Business Administration for homeowners, renters, businesses of all sizes and private non-profit organizations. The loans cover losses not covered by insurance. Napa and Solano County residents can apply for assistance online at DisasterAssistance.gov or by smartphone or tablet at m.fema.gov. They also can call (800) 621-3362. FEMA and the state OES have opened a Solano County Disaster Recovery Center at 1155 Capitol St. in Vallejo and a Earthquake Local Assistance Center at 301 First St. in Napa. Both offer face-to-face assistance with OES, FEMA and Small Business Administration specialists. Both are open 9 a.m. to 6 p.m. weekdays and 9 a.m. to 4 p.m. weekends. Holiday hours on Veterans Day, Nov. 11, are 10 a.m. to 3 p.m.